About three years ago, my husband and I spent three weeks travelling down the west coast of Australia. One thing I miss about Australia are the meat pies with delicious fillings, flavoursome gravy in a flaky buttery crust. 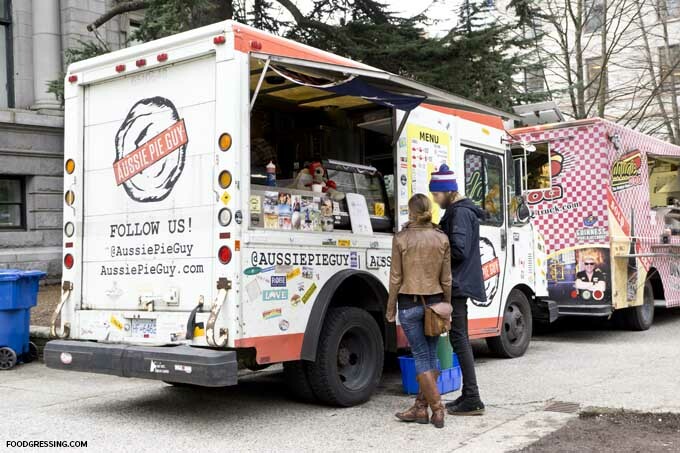 I get to relive a bit of the Australian pie experience through Aussie Pie Guy in Vancouver and Peaked Pies in Whistler. I have ordered from Aussie Pie Guy a few times over the last two years and have been a fan of their pies. 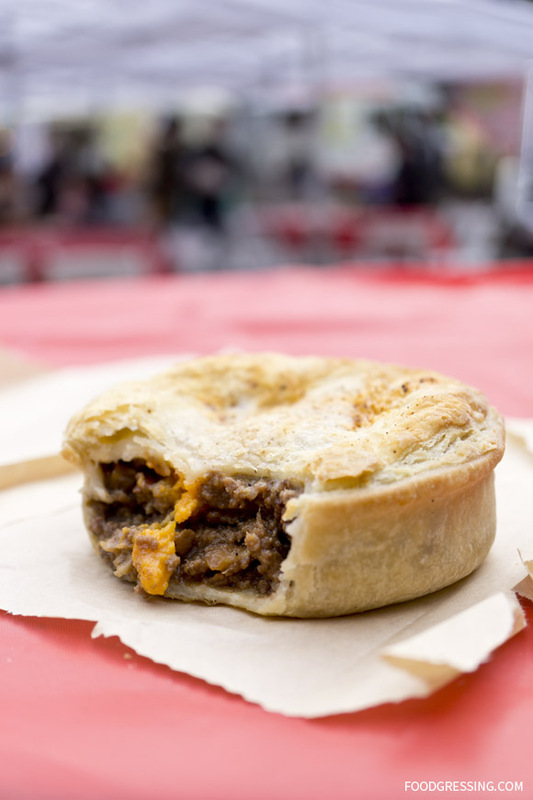 The Australian meat pie is characterized as a hand-sized meat pie containing largely diced or minced meat and gravy, sometimes with onion, mushrooms, or cheese and often consumed as a takeaway food snack. In Vancouver, Aussie Pie Guy offers a selection of Australian-inspired meat pies with a West Coast flair. Many of their ingredients are locally sourced and are higher quality including free range BC beef, free run chicken, organic roasted vegetables and BC apples. For ginger beer lovers, Aussie Pie Guy carries Australia’s Bundaberg Ginger Beer. Their selection of pies includes the Aussie Pie, The Trifecta, Shane’s Pie, Chook Pie, Veggie Pie, and Sweetie Pie. They also have rotating specials. The first time I ordered from Aussie Pie Guy, I had the traditional Aussie Pie ($8 including tax). It had chunks of free range BC beef and onion in a pepper gravy made with Howe Sound Rail Ale from Squamish, B.C; I was instantly hooked. The pie was hot, hearty and oh-so-good. The crust was thin but still held together well. It was not the most buttery and flaky pie crust I have had but still delicious. After this, I decided to buy their frozen pies and bake them at home. I ordered them through Spud.ca where they come in a 4 pack for $26.99; they were perfect for a busy weekday. After trying all their frozen varieties, my favourite would have to be The Trifecta. It is crazy good with B.C minced beef, chunks of BC double smoked bacon and layers of vintage cheddar all in a rich gravy. 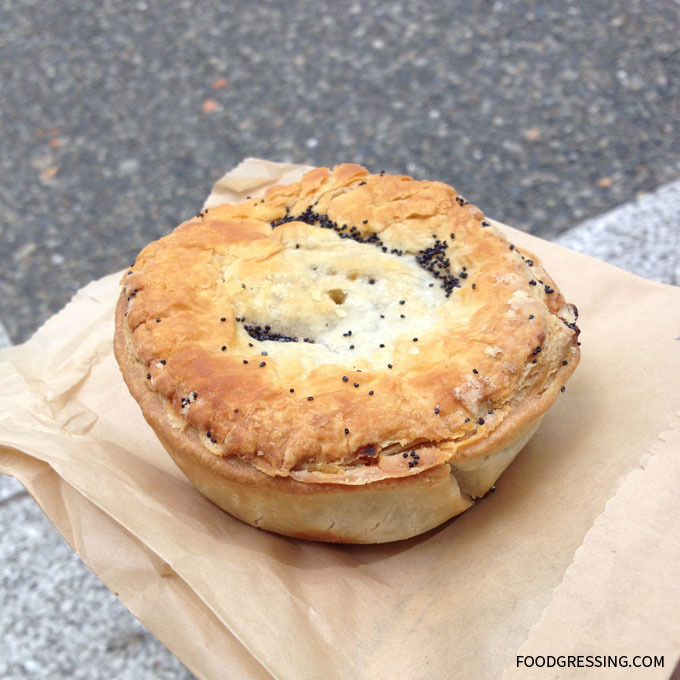 Yesterday, I visited Aussie Pie Guy as they were part of Dine Out Vancouver’s Street Food City. Their Dine Out Special was a Kanga Pie and an Anaz cookie for $9 including tax. The Kanga pie had kangaroo meat and was delicious as expected. It is also made with Australian pepperberry spice with sweet potato and double smoked BC bacon in a red wine gravy. The taste was on the sweeter side from the potato. I loved how the pie hold together so well. You can eat it with your bare hands and it doesn’t turn into a sloppy mess. 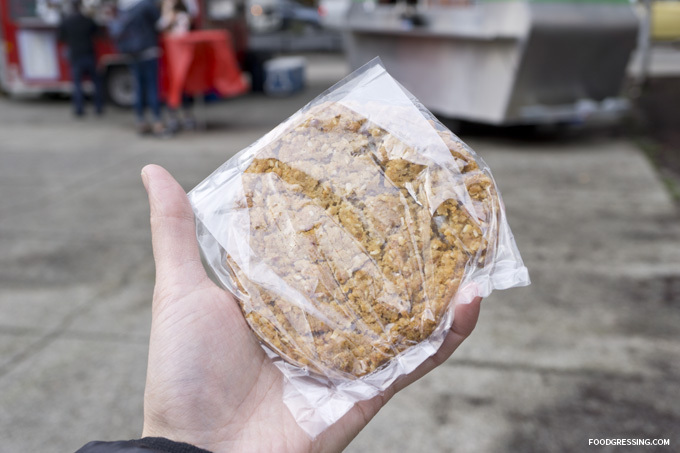 The Anaz cookie came prepackaged in a plastic bag and had rolled oats, coconut and golden syrup. It was very fragile as it had crumbled after I put it in my bag. The cookie was a nice add-on though nothing really to write home about. 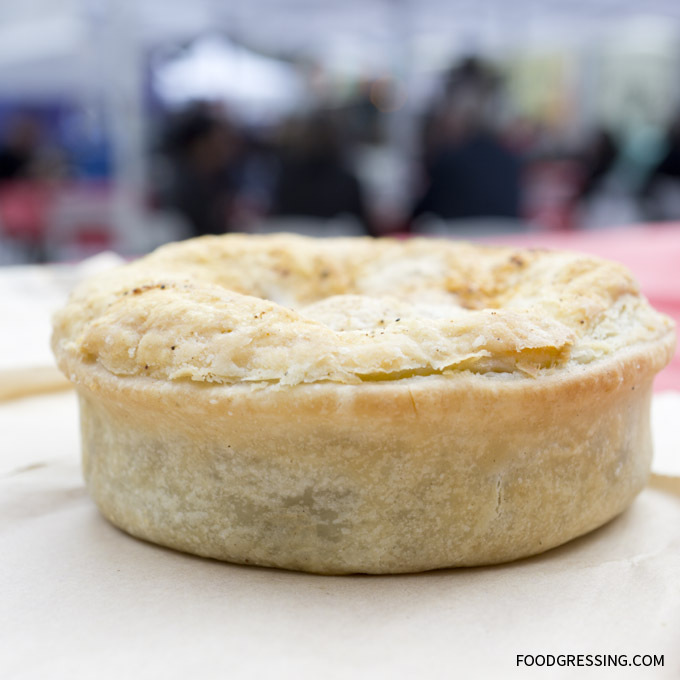 Because Aussie Pie guy uses higher quality ingredients , there is a premium to the pies. I really wished they had a budget pie, for say $5. I personally would buy their frozen pies and bake them yourself; each pie comes out to be under $7 versus $8 at the food truck.